CERT stands for Community Emergency Response Teams. Individuals serving on CERT teams are authorized to respond immediately in the case of a natural disaster or other community emergencies. Though they are not necessarily certified or trained firefighters or paramedics, they do have training in emergency response. CERT kits are designed to assist those responders so that they have instant access to needed supplies. There are small kits that provide the basics and larger kits that contain everything a well-trained emergency respondent may need during a flood, hurricane, explosion, wild fire or many other emergency situations. For serious CERT professionals who want to ensure that they have more tools on hand when an emergency occurs, there are Intermediate and Advanced CERT kits. 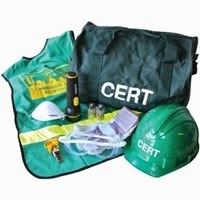 The Intermediate CERT Kit contains a more extensive collection of responder tools into a duffle bag, and the Deluxe and Ultra Deluxe CERT Kits offer even larger collections of tools packed into easy-to-carry backpacks. For situations that require responders to stay mobile, the larger kits are more convenient. They are carried on the back, so responders can quickly move from one person or one disaster area to another without holding their kit. While the Deluxe CERT Kit and Ultra Deluxe CERT Kit certainly offer the most protection for communities experiencing emergency situations, the Basic and Intermediate kits have their benefits as well. For instance, the Basic CERT kit is compact, so it fits easily into some storage areas that are too small for the larger kits. Responders should think about where they will store their kit, what type of emergency is most likely to require the use of their kit, and whether they need to remain mobile while using their kit. These guidelines will help every responder select one or more kits that fit his or her needs in a variety of emergency circumstances.